More than 300 diagnoses that are delineated, referenced, and lavishly illustrated highlight the third edition of this bestselling reference. World-renowned authority Dr. Anne G. Osborn and her expert author team of Drs. 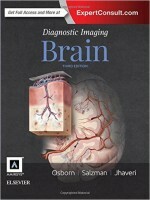 Karen L. Salzman and Miral D. Jhaveri provide carefully updated information in a concise, bulleted format, keeping you current with new disease entities and syndromes, MR imaging techniques and applications, and pathology relevant to brain imaging. Succinct text, outstanding illustrations, and up-to-date content make this title a must-have reference for neuroradiologists, general radiologists, neurologists, and neurosurgeons. This reference book showcases concise, bulleted text provides efficient information on more than 300 diagnoses that are clearly illustrated with 2,500 superb images. This book’s key features include meticulously updated throughout, with new diagnoses and hundreds of new images that provide the most current information in the field, expert guidance on CLIPPERS, second-impact syndrome in trauma, perfusion MR for tumor characterization, susceptibility-weighted imaging in stroke and brain bleeds, and molecular markers in brain tumor classification and grading as well as updated coverage of brain trauma addresses newly recognized entities, techniques and imaging for rapid stroke triage, and functional imaging and dementia diagnosis.